Tory islanders in general and the Doohan family in particular are delighted that Duggie has adopted Tory as his 'home'. 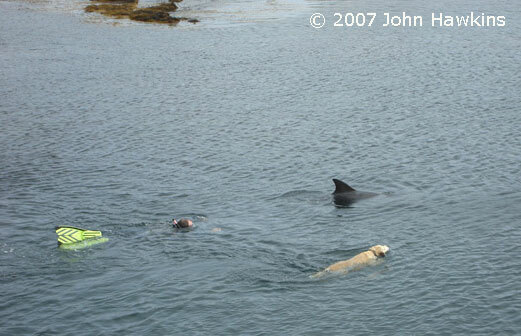 They are very welcoming to parties of adults and children who have come out from the mainland to swim with Duggie. No one makes a big fuss about the dolphin being there but at the same time they are justifiably proud of the fact. The ferry operators clearly enjoy Duggie keeping them company too. Probably no community, with the possible exception of Dingle, has given such a universal welcome to an interactive dolphin. What's more, no one is running 'boat trips to the dolphin' and 'dolphin tourism' to Tory is minimal, so it can hardly be said that the dolphin's popularity has anything to do with increased revenues to the local economy!